Mapping the lesser-known birding hot spots along the upper Texas coast. For as long as I can remember, maps, secret or otherwise, have captured my imagination. Who can forget those spellbinding tales of high adventure, cryptic diagrams, lost islands and hidden treasure we read as children? Edgar Allan Poe’s The Gold Bug and Robert Louis Stevenson’s Treasure Island, replete with wily buccaneers and buried chests of gold, enthralled us with each setback and wrong turn until, at last, all riddles were solved, maps deciphered and booty retrieved. And then we grew up. Yet that yearning for high adventure and surprise never truly dwindles. We long to recapture the feeling of discovery that fuels our need to compass the outside world. For many people, chasing birds has become tantamount to searching for hidden treasure: to finally catch a glimpse of a long-sought-for bird; to observe the drama of a peregrine in full stoop, launching rafts of waterfowl into panicked flight; to savor the sweep of clouds of raptors roiling across the autumn sky; or perhaps to spot a far-flung vagrant, the first of its kind, to land upon our shores. Such are the tantalizing possibilities that stir us to venture forth in search of avian splendors of our own devising. And for this, there is nothing like a treasure map to guide us on our quest. 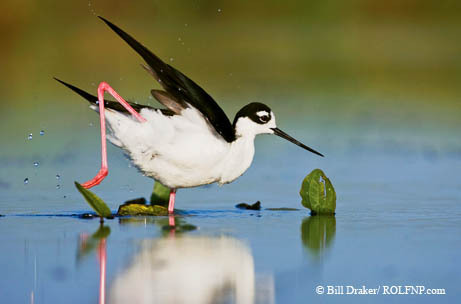 The Texas Parks and Wildlife Department offers three color-coded maps visitors can use to navigate the interconnecting byways of the Great Texas Coastal Birding Trail. Colorful and informative, they provide a fail-safe Ariadne’s thread to lead expert and novice alike to the richest and most productive birding sites along the coast. But unlike the maze of the Minotaur, there is more than one way in and out. We can start at the beginning, at the end or anywhere in between. Let season, weather, time of day, habitat type or target birds be your guide. As it is with any kind of treasure hunt, the fun is in the finding. April 20 clips spring migration at its peak along the upper Texas coast. 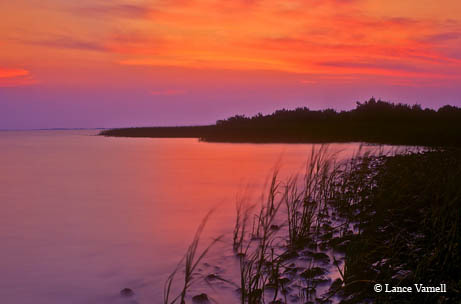 High Island, Anahuac National Wildlife Refuge and Bolivar Flats are a must, of course, but that story has oft been told. Instead, we highlight three lesser-known stops along the trail — Yacht Basin Road, Rollover Pass and White Memorial Park. Hurricane Ike blew through this area in 2008, and storm damage, time and tide have made this an evolving bird habitat. Our quest begins well before dawn in the town of Winnie. Even the darkness moves with the passage of birds. Before the swell of traffic noise, we pause awhile to listen. High above, we recognize the rich, rolling trills of upland sandpipers and the muttering of other shorebirds as they wing their way invisibly to northern breeding grounds. Driving south on Texas Highway 124, we head for our first stop at Yacht Basin Road on Bolivar Peninsula. Bird possibilities abound along the route there — in the air, in the ditches, over the marshes, perched in trees or on telephone wires. 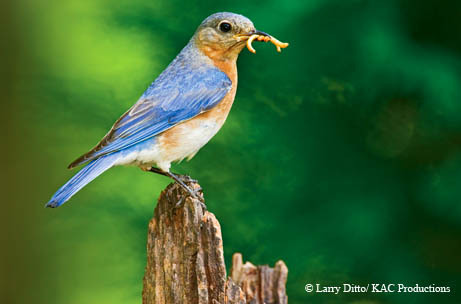 The trick to savvy birding at 50 mph is habitat, habitat, habitat. As we travel through a mix of coastal grasslands, scrub and woodlands, rice fields, freshwater swales, salt marshes and tidal sloughs, bird associations change, as do our expectations. Up ahead we spot a flurry of activity — foraging roseate spoonbills, white ibises and great and snowy egrets vie for fish and frogs in a rain-swollen ditch. Farther down, we spy a sora slipping narrowly through the reeds, while two common moorhens float lazily at the water’s surface. With increasing light, wavering lines of white and white-faced ibises and double-crested cormorants converge on time-honored feeding spots, while small flocks of little blue and tricolored herons and great, snowy and cattle egrets create complex patterns across the sky. In the trees to the left, Baltimore orioles and indigo and painted buntings greet the morning sun. Perhaps we’ll see feisty eastern kingbirds harassing everything in sight, and red-winged blackbirds, with scarlet and yellow epaulettes extended and ablaze. The large grackles along the edge of the marshlands to the right are boat-tailed grackles. We note their dark eyes and their bizarre yet catchy songs, so different from the harsh squawks and whistles of the great-tailed grackles, those city cousins that some call an urban blight. The reedy side-road to the right, just before reaching the Intracoastal Highway bridge to High Island, may host several loudly singing marsh wrens in the cattails and sedge wrens farther back in the soggy fields. Another lucky find, an American bittern, flushes up with a hoarse croak, so close yet seemingly from out of nowhere, its size and chunky profile a giveaway. Driving over the bridge, we now watch for belted kingfishers and scan the skies and marshes below for ospreys or northern harriers. Still early in the day, any raptor is a plus, as thermals strong enough to lift and waft kettling hawks northward have not yet formed. As we pass High Island, we quickly note how many cars are parked outside the Houston Audubon Society’s Boy Scout Woods to our left — and we continue on sans hesitation. On Texas Highway 87, we head west along the Bolivar Peninsula. On the right, we scan the short-cropped pasturelands for upland sandpipers and American golden-plovers, killdeer and the odd black-bellied plover. Eastern meadowlarks are seen perched jauntily on the wire. Sudden flashes of yellow, black and white flying low across the fields — two male yellow-headed blackbirds heading west — trigger immediate oohs and aahs. If spiderworts are in bloom along the shoulder, we check carefully, with crossed fingers, for possible bobolinks nipping at the buds, by no means a sure thing. We sail past Rollover Pass for now (we’ll catch it on the way back) and head on one-half mile to our first stop, Yacht Basin Road on the right. Though only a half-mile long, Yacht Basin Road cuts through grassy fields, cordgrass marshes, tidally inundated salt marshes and gravel dredge spoils, coming to a dead-end at the boat launch on the Gulf Intracoastal Waterway. This stop can be amazingly productive. Our hope is to add a few classic skulkers, otherwise difficult to ferret out, all designed to satisfy our species-hungry appetites, as well as a few “surprise-me” birds flying over marsh or channel. We call this spot the “Rail Road,” as clapper rails and soras are almost certainties. So bold are the clappers here, they can be seen walking blithely down the center of the road, a most un-rail-like activity. Rails slip weightlessly through their reedy world unseen, free and fluid in their element. We are sure to see and hear the “pill-o-will-o-willet” of willets, flashing their black-and-white semaphore wings in defense of nesting territories. Scores of whimbrels, the “seven-note” bird with the decurved bill, use these spartina marshes, interlaced with patches of sand, as a staging area on their way north to their Alaskan tundra nesting grounds. We see them every year. Next, we scan the edges of the sandy spots for possible Wilson’s plovers, the small ringed plover with a big head and hefty bill. We also watch for Nelson’s sparrows perched in the tidally inundated salt marshes not far from dusky-hued seaside sparrows at the end of the road. Long-billed curlews and marbled godwits grace the sand and mudflats to the left, adding a blush of rufous color to an otherwise somber landscape. The spoil islands just beyond are good for one or two red dagger-billed American oystercatchers, walking along the water’s edge, calling boisterously or shucking shellfish with deft aplomb. Yacht Basin Road always produces a great “tern-out.” We have seen Caspian terns, royal terns, Forster’s terns, gull-billed terns, Sandwich terns, least terns, black terns in migration and, of course, flotillas of black skimmers. Amid the hordes of laughing gulls, Bonaparte’s and a few herring gulls, we also watch for small migrating flocks of Franklin’s gulls heading north to their central prairie nesting grounds. After turning up all that birdy booty, both hidden or aloft, we hop back into the van and head east along the Bolivar Loop to Rollover Pass. Rollover Pass is a man-made cut through the Bolivar Peninsula, linking the East Bay to the Gulf Coast. Working both sides may deliver a corsair’s bounty of birds, but much depends on the level of the tides and luck. At low tide, extensive tidal mudflats host many hundreds of foraging and roosting gulls, terns, pelicans, herons and egrets. We watch especially for reddish egrets, both dark and white morphs, performing their canopy-feeding fandango in search of schooling fish. Contrast this with the tidy groups of American avocets and dapper troops of black-necked stilts facing stoically into the wind, while marbled godwits stand guard near the water’s edge. Spoil islands on the bay side likewise serve as colonial water bird rookeries replete with nesting roseate spoonbills and great and snowy egrets. Just across the road on the Gulf side, a three-minute walk away, we watch for lingering red-breasted mergansers, common loons and possibly a few scoters — surf or white-winged the most likely — and perhaps hundreds of buoyant Bonaparte’s gulls, fluttering gracefully over the waves. Who knows, a northern gannet is not impossible. Though more common in August, the magnificent frigatebird, a piratical bird in both name and decorum, occasionally turns up, as well. We take Texas Highway 124 north back to FM 1985 and turn left. As we proceed, we check the wires for swallows — barn, cliff and lingering tree swallows. Passing over water just before the turn, we spot two or three bank swallows, perched atop the wires. The rice fields along FM 1985 typically teem with shorebirds. We quickly scan active flooded fields for foraging flocks of Hudsonian godwits or white-rumped sandpipers, late migrants. We watch especially for birders stopped along the road. They may have buff-breasted sandpipers or American golden-plovers in nuptial plumage in their scopes. We always try to save White Memorial Park for dessert. It’s a palate cleanser par excellence. After a dizzying surfeit of shorebirds, marsh birds and water birds of every stripe, this little-known gem of a country park is like stepping into a different world. We feel at once sheltered and enclosed, almost dwarfed by the rich stands of pine, sweetgum, oak and magnolia. Turtle Bayou, lined with grand old cypresses, winds along the far edge of the park, recalling the more sultry habitats of East Texas. We’ve left the glare of open skies and entered the low-lit seclusion of semi-closed canopy woodlands. The older trees still remaining after two destructive hurricanes continue to attract woodpeckers, though park custodians have removed several of the snags. We will have to search harder for the pileated, red-bellied, red-headed, downy and hairy woodpeckers we used to find so readily in years past. The deciduous hardwoods still host several species of eastern woodland birds. 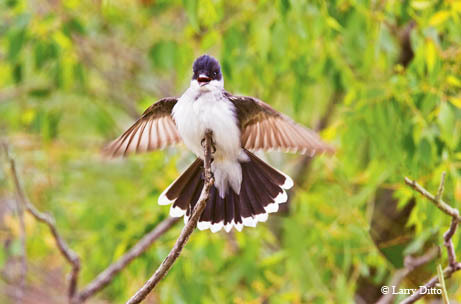 Great crested and Acadian flycatchers, Carolina chickadee, tufted titmouse, Carolina wren and summer tanagers fill the hardwoods, while pine warblers ply the loblolly pines and chipping sparrows forage collegially on the ground below. By the third week in April, the park is drenched in song, especially sonorous towards dusk. Meanwhile, in another part of the forest, further treasures lie well hidden, revealed mostly by their siren songs. We search the ground in the moist, wooded areas along the creek for Swainson’s warbler, who announces himself in clear, emphatic, ventriloquial notes. Hooded warbler and Louisiana waterthrush join in, as they defend nesting territories here. At the last stop, before looping back to rejoin Texas Highway 61, we check the grounds near the stables at the northern end of the park for eastern bluebirds. To capture the bluebird of happiness — what better way to end the day. When the world seems too much with us and we feel we’ve lost our way, recapturing the thrill of childhood adventures does much to heal the soul. Every year, we plan a springtime journey to the coast, our trusty birding map in hand, in search of avian treasure. The joy and solace of such a quest for birds — aloft, hidden in plain sight or merely heard — means this: We are a part of that mysterious web of adaptation, and each spring we can renew that bond. This is how and where we go to reconnect — to take in spiritual nourishment from the natural world and learn once more our place within the cosmos.